With pineapple, macadamia nuts, and cheddar cheese, this is a delicious twist to an easy, healthy summer side dish. This gluten free recipe is also lightened up with Greek yogurt. 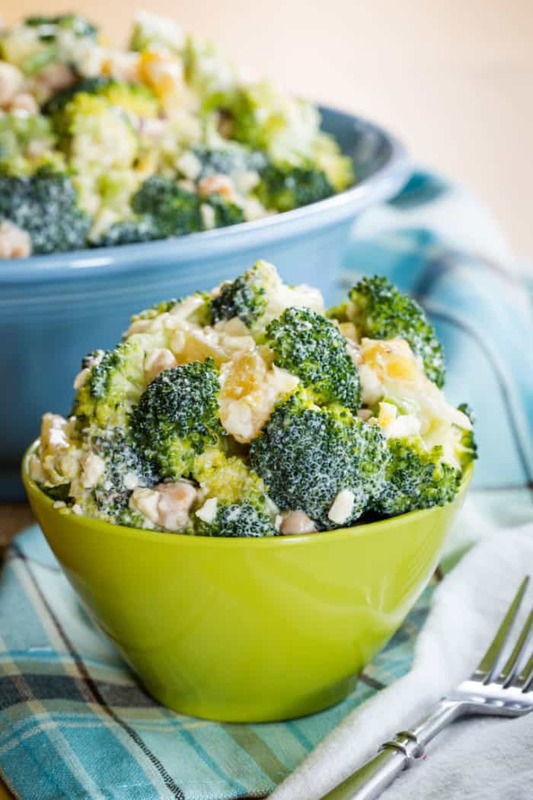 Broccoli salad gets a bright and fresh twist with the addition of pineapple, macadamia nuts, and sharp cheddar cheese. 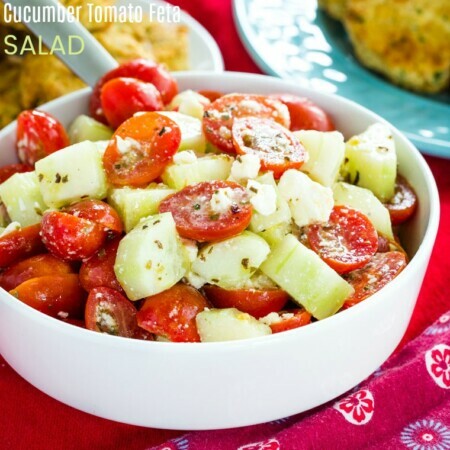 Plus it is lightened up with Greek yogurt so it’s a healthier option for one of the best salad recipes to bring to summer picnics and barbecues. 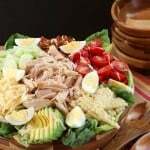 You can even make broccoli salad in advance, or throw it together when you are grilling in the backyard for dinner. 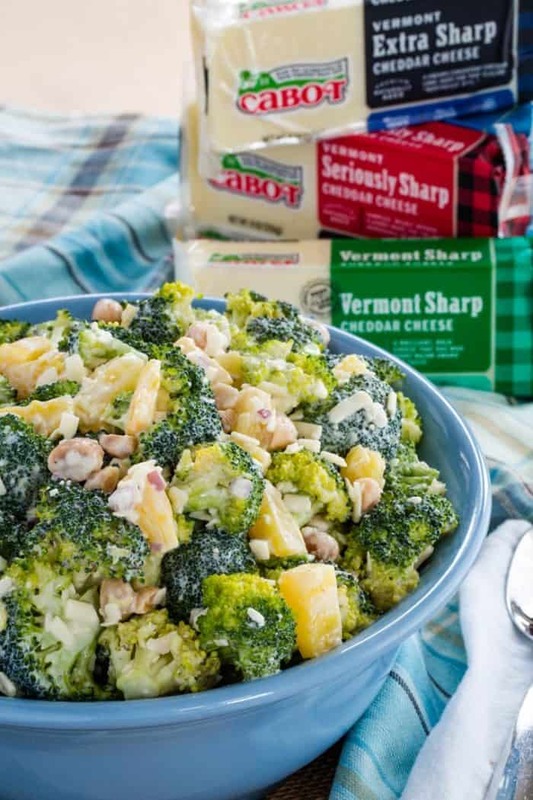 With only a few ingredients and about ten minutes of prep time, you’ll be making this Tropical Pineapple Broccoli Salad all season long. Disclaimer: This recipe was developed through a sponsored partnership with Cabot Creamery Co-operative. As always, all opinions are my own. My husband bought a pellet grill. Here’s the thing, though. He bought it in November. Not exactly prime time for having meat cooking outside for hours on end. I mean, we live in Maryland. I know it’s not Wisconsin, but it’s still cold. Of course, it is equipped with wifi and temperature sensors and automatic pellet feeders and such. So it’s not like he is standing out there tending to it. But it does have to work a bit harder to maintain the temperature when it’s only, you know, thirty degrees outside. It’s also not quite the time of year to be inviting over crowds of people for a backyard barbecue to be able to eat those ten-pound pork butts and five-pound briskets and six racks of ribs. However, none of this stopped him. He spent the winter testing out some different recipes and techniques, we froze the leftovers and just pulled them out when something came up and there wasn’t time to cook. 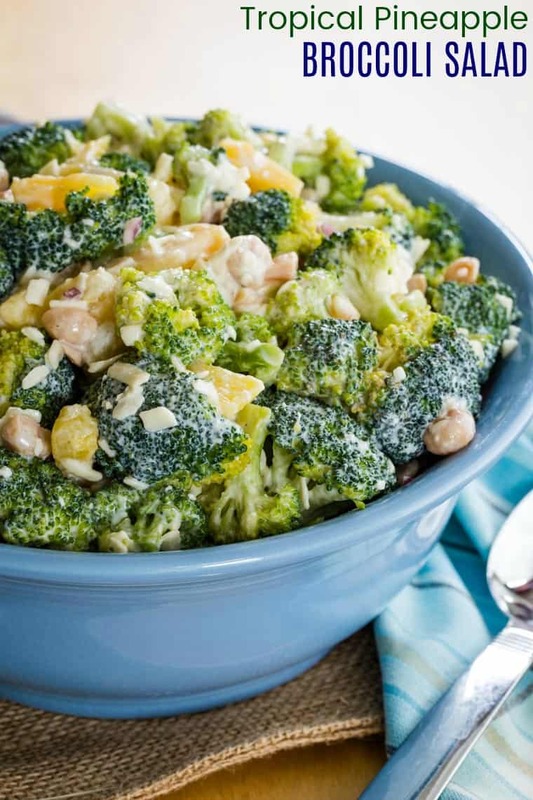 Tropical broccoli salad with pineapple and macadamia nuts is easy side dish has an amazing blend of flavors and textures. The broccoli is crisp. Pineapple adds juicy sweetness to balance the savory mustard in the dressing, the hint of red onion, and the cheddar cheese. And then you get the bit of crunch from macadamia nuts. It is creamy but fresh and balanced with the zing of tropical citrus flavor. 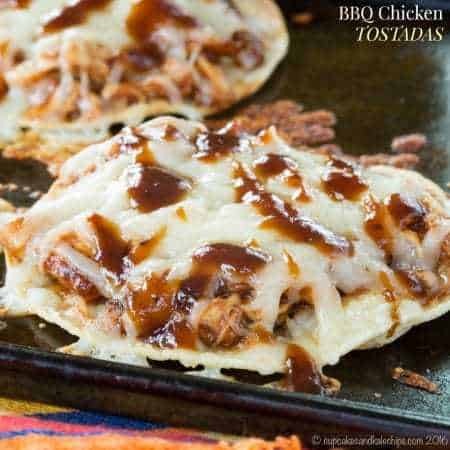 It would be perfect with an Easter ham, as well as with Cheesy Maple Dijon Chicken Foil Packets or even a burger or steak on the grill. What goes in broccoli salad? 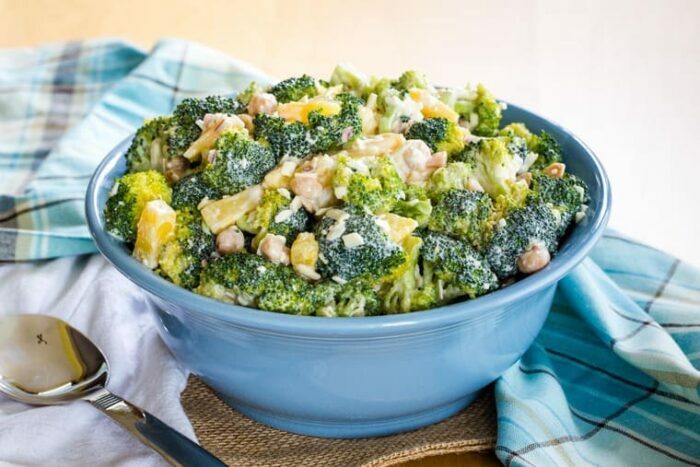 While most broccoli salad recipes are made with mayonnaise, this is lightened up with Greek yogurt for that creaminess plus a bit of olive oil to get the slight richness you typically get from mayo. The dressing also has Dijon mustard, pineapple juice and honey, and salt and pepper. Raw broccoli is used, cutting it into florets. You can make them any size you like. Larger will add more crunch, smaller will allow the dressing to coat each piece more. This recipe calls for canned pineapple tidbits because they are typically softer and juicier than fresh pineapple. Plus you can use the pineapple juice from the can to make the dressing. But you can use fresh pineapple if you prefer. Macadamia nuts add crunch and a rich flavor. Chopped cashews would be another option. I don’t typically like raw onion, but just a bit of finely minced red onion or shallot enhances the flavor. Then let’s not forget the Sharp Cheddar Cheese from Cabot Creamery Co-operative to complete the dish. Cabot is a co-operative owned by farm families throughout New England and New York and 100% of profits go back to the farmers. They have been making high-quality dairy products since 1919, and with a 100-year history, you know their award-winning cheddars will make this and any recipe extra delicious. 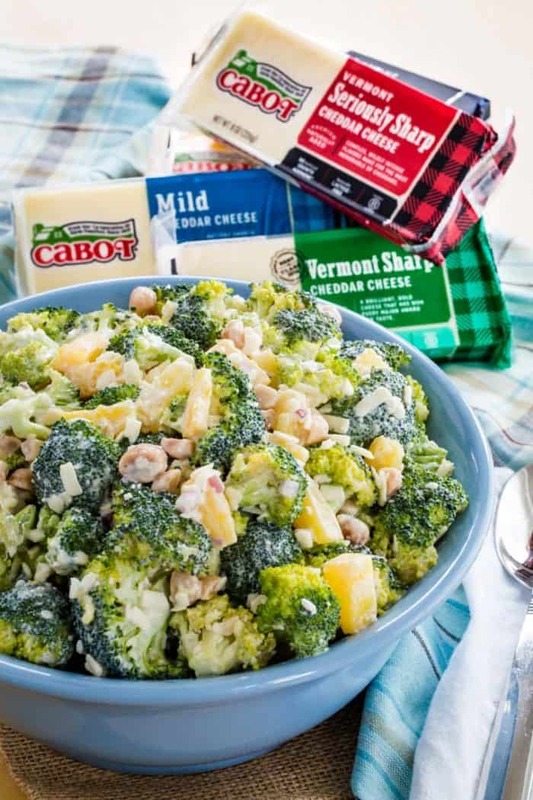 You can use your favorite Cabot cheese, from Vermont Sharp to the Legacy Collection Farmhouse Reserve. Whatever cheese you choose, you’ll taste Cabot’s commitment to making the best products in every bite. Plus Cabot is dedicated to communities, the environment, and volunteers. Learn more about not only the products, but also their B Corporation certification and the Reward Volunteers program by following them on Facebook, Twitter, Pinterest, and Instagram. Yes, and in fact, we think it tastes even better when it has had overnight or even a couple days to sit in the fridge and absorb all of the flavors. It also slightly tenderized the broccoli and takes out a bit of the bitterness you can sometimes get with raw broccoli. 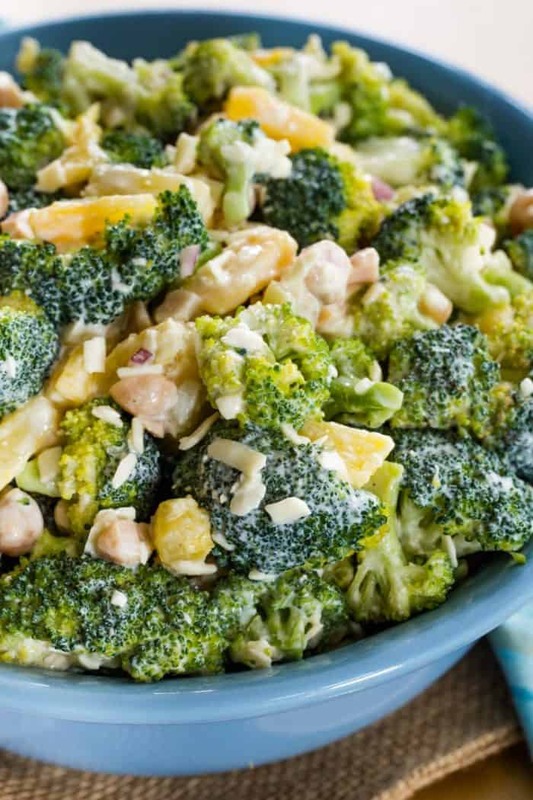 So definitely make this Tropical Pineapple Broccoli Salad in advance to let those flavors develop and save yourself time on the day of a holiday or party. Just keep it in the refrigerator and it’ll be good for a few days. Definitely do not freeze it, though. The broccoli will be mushy and the dressing will get watery. If you feel this recipe makes more than you need, you can definitely cut it in half. 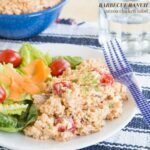 What are more salad recipes with cheddar cheese? 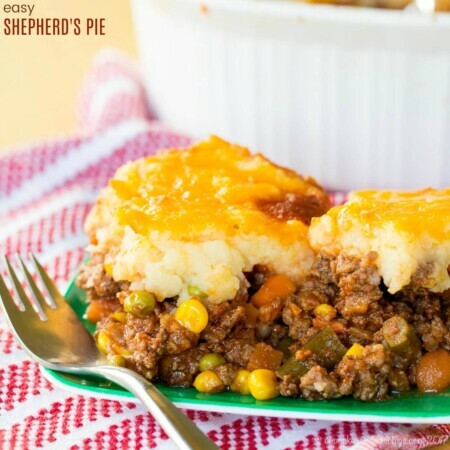 This easy side dish recipe has the perfect blend of creamy deliciousness with fresh flavors and crisp and crunchy textures. And don’t forget the pop of bright and juicy pineapple. 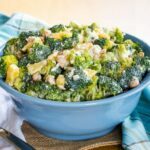 Made with Greek yogurt, this is a healthy broccoli salad recipe that’s also naturally gluten free. 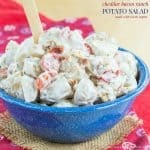 It’ll be the perfect addition to any party or picnic menu since you can make it ahead of time. 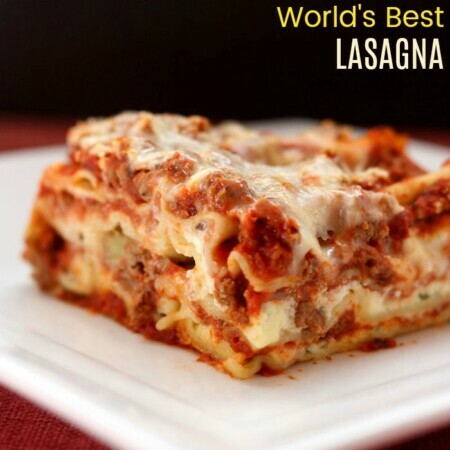 But it also fast to prepare if you want to have it for dinner on a busy weeknight. In a large bowl, combine the Greek yogurt, olive oil, Dijon mustard, honey, apple cider vinegar, pineapple juice, salt, and pepper. Stir until smooth. Add the broccoli florets, pineapple, macadamia nuts, red onion, and cheddar cheese. Stir until everything is combined and coated. Serve immediately or store in the refrigerator up to three or four days.